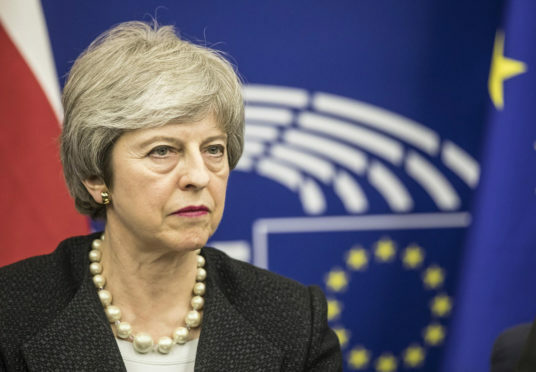 The prime minister, appearing in the Commons after another late night round of negotiations in Brussels on Thursday, was accused of “abject surrender” by Brexiteer MP Sir Bill Cash. The explosive exchanges came just hours after former Brexit secretary David Davis warned Mrs May that calls for her resignation would now “increase dramatically”. Undeterred, Mrs May told MPs that it was their “national duty” to reach an agreement on the UK’s withdrawal from the EU. She added: “I welcome the discussions that have taken place with the Opposition in recent days – and the further talks which are resuming today. “This is not the normal way of British politics – and it is uncomfortable for many in both the Government and opposition parties. SNP Westminster leader Ian Blackford warned Mrs May that his party would not “accept any Brexit deal cooked up by the Tory government and signed, sealed and delivered by the Labour party”. Banff and Buchan Tory MP David Duguid said he was “extremely disappointed” that the UK had not yet left the EU with a deal. He said: “There has been too much political game-playing – and a certain amount of intransigence from a few members of my own party. “My constituents – no matter if they voted Leave or Remain – have had enough of the delays and they just want us to get on with it. Gordon Tory MP Colin Clark added: “The extension is regrettable. To avoid taking part in the European Parliament elections, which would make a mockery of the referendum, we must get the withdrawal agreement ratified before May 22.